Four years ago, I suffered from severe postpartum depression. Four years ago, I suffered from severe postpartum depression. I had no idea that could happen to me. I had no idea what was happening to me. All I knew was that something was wrong with me because I was the only one who didn’t experience the magic of motherhood. I know now that’s not true. I know now that hundreds of thousands of new moms suffer from postpartum depression each year. Many just don’t talk about. In honor of Mental Health Awareness month and because maternal mental health matters, I’m sharing the heartbreaking thoughts that constantly filled my mind while I was sick. I hope that if I share, so will you. We can be brave together and shed more light on this taboo subject of motherhood. 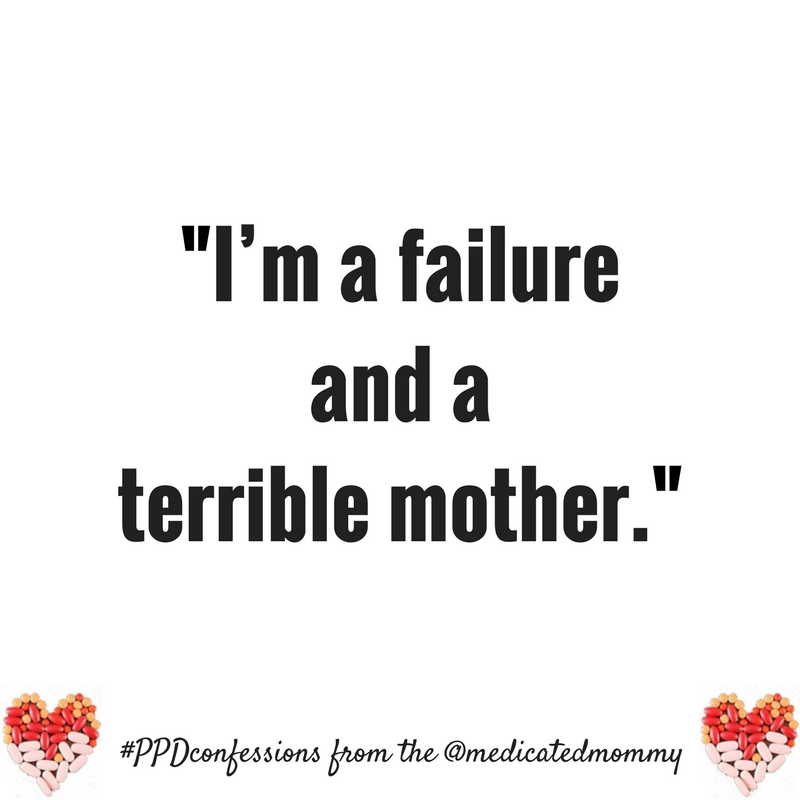 Here are several postpartum depression confessions, from me, The Medicated Mommy. Postpartum depression told me so many lies. Postpartum depression convinced me I didn’t want to be a mother. Postpartum depression made me feel like I had to hide my feelings. Postpartum depression made me question everything I thought I knew about motherhood. Postpartum depression convinced me I would stay sick forever. Postpartum depression made turned me into a beggar. Postpartum Depression showed me the necessity of getting professional treatment. Postpartum depression taught me the importance of taking care of myself so I could take care of my baby. Postpartum depression taught me I wasn’t alone. Postpartum Depression led me to accept and fall in love with the mom I was, not the one I belived I should have been. At some point, all of us will know a new mom suffering from some form of postpartum depression. It’s up to all of us to educate ourselves so no new mom suffers in silence. Click here to receive your free copy of my WTF are Postpartum Depression and Anxiety: The Friends and Family Guide For How to Help, What to Do and What Not to Say. Jen Schwartz is the medicated mommy who picked up the debris left by postpartum depression and anxiety and created MOTHERHOOD-UNDERSTOOD, a platform for the 1 in 7 moms affected by maternal mental health issues and the community she couldn’t findwhile struggling in a dark closet all by herself after the birth of her son. Jen gives permission slips to women who aren’t exactly enamored with their new role as mommy, so they can allow themselves to be the most real and honest versions of themselves. She helps them empathize, share, and connect with others who speak their language—moms who understand that new mommy life isn’t always the way it looks on Instagram. Jen is committed to shining the light on the darkest of places, where maternal mental health taboos have been hiding out, trying to make us believe that we are not enough and all alone. Jen is a writer, speaker, and influencer whose work has been featured all over the mommy blogosphere and on popular websites like The Mighty, Healthline, Pop Sugar Moms, Scary Mommy, CafeMom and more.